Buy high quality scoopfree cat litter petsafe. 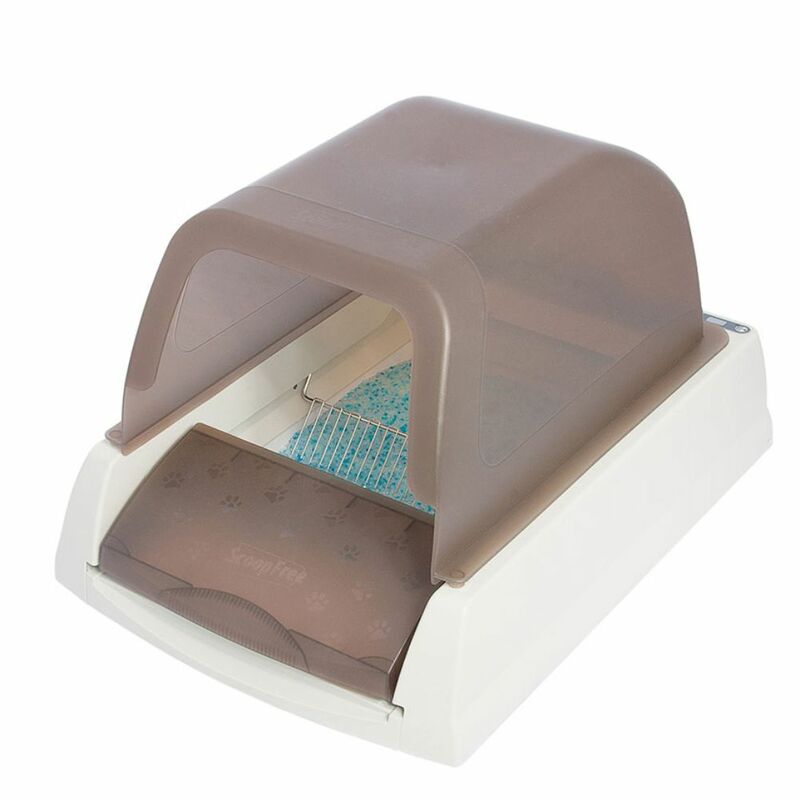 The self-cleaning ScoopFree Cat Litter Box is a revolution in cat Litter trays! It comes with a disposable Tray of high-quality silicate cat litter, which self-clean for a week and can uses 5-10 times less Litter than standard cat Litter boxes. 26.5 x 22.5 cm (W x H) Tray height: 17.8cm Entrance height: 10-17cm Refill pack: replacement Tray of ScoopFree Silicate Cat Litter – Blue at a glance: Easy to use: disposable Tray (with lid) that can be inserted in just 1 minute With silicate cat litter: smells fresh and clean Protective plastic coating: ensures that nothing leaks out Easy and environmentally-friendly disposal: Tray with Litter can be disposed of easily, cleanly and hygienically Material: corrugated paperboard with foil-coated base Contents: 2.04kg silicate cat Litter Dimensions: Total: 55.5 x 37 x 6 cm (L x W x H) Waste compartment: 15 x 35.5 x 5.5 cm (L x W x H) Recommended time fram for changing the tray: 20-30 days when used by 1 cat, 10-15 days when used by 2 cats, 7-10 days when used by 3 or more cats..
ScoopFree Cat Litter Box at a glance: Revolutionary, self-cleaning cat Litter box With disposable Litter Tray with sealed waste compartment: helps to keep clean cat Litter ready, collect solid waste and allow for easy and environmentally-friendly disposal Effective and unbeatable odour removal: absorbs moisture and dries out solid waste, helping reduce the volume Includes 2.04kg of high-quality ScoopFree Silicate Cat Litter – Blue: Allows for one week of freshness and cleanliness Uses 5-10 times less silicate Litter than standard Litter trays: more economical, better value for money and easier to store 99% dust-free: to keep the surrounding area clean Adjustable cleaning cycle: no need to worry about daily cleaning for the whole week, automatically or manually sweeping waste into the sealed waste compartment (5, 10 or 20 minutes after use) Removable hood: protects your cat’s privacy and prevents odours and Litter from spilling out Quiet but strong motor: no background noise Patent protected Adapter including 3 different plugs (EU, UK, AU): Input: 100-240V, 50/60Hz, 0.8A Max Output: 18V, 0.833A Cable length: 1.8m Included: ScoopFree self-cleaning cat Litter box, replacement tray, 2.04kg silicate cat Litter – blue, adapter, instruction manual Manufacturer’s guarantee: 2 years Colour: taupe Dimensions: Total: 69.5 x 48.2 x 43 cm (L x W x H) Inner: 35.5 x 35.5 x 42 cm (L x W x H) Entrance: approx. The lid of the ScoopFree Cat Litter Box also helps prevent Litter being kicked out, helping to keep the area clean and hygienic. The generous hood helps protect your cat’s privacy, as well as restricting odours. The data can be gathered and passed on to your veterinarian. Never again do you need to bother yourself with daily cleaning of your cat’s Litter tray! Health monitor: an integrated sensor in the Litter Tray measures how often your cat uses the tray, showing frequency of use on the display. This ScoopFree Cat Litter Box offers an adjustable cleaning cycle, allowing you to determine when waste materials are automatically raked into the sealed waste compartment, leaving your cat clean litter. The 99% dust-free Litter absorbs moisture and dries out solids, as well as offering effective, unbeatable odour control! The cat Litter is economical, better value for money and easier to store.